The Sports Hall is available for hire for sporting and non-sporting activities. It is an excellent venue for discos and skating. Hire includes use of the sound system. A brand new Thorlux lighting system was installed in September 2014 which meets levels recommended by Badminton England. The entire Sports Hall can be hired for £32.00 per 55 minutes with half the hall available for £16.00. 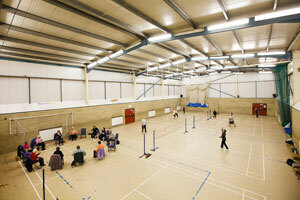 The Sports Hall can be hired with any of the centre’s other rooms including our licensed bar.